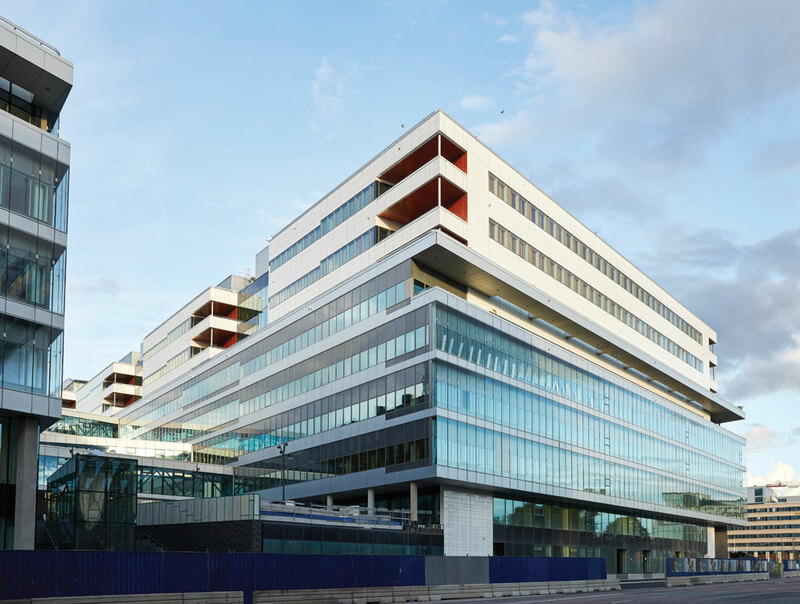 Recently opened after a 12 year gestation in the north of Stockholm, the new Karolinska University Hospital presents itself more as an entire urban block than a stand-alone building. The client was unusual for a major healthcare project, being the County Council, but the extent to which the project knits into the urban fabric made its perspective key to creating a successful masterplan. As well as creating a colossal 330,000 m2 building with 629 individual patient rooms and 35 operating theatres, the client’s overarching aims also included architectural quality, attractive environments for patients, and a building with a clear civic presence. Most importantly, perhaps, the new building reflects the client’s strong focus to transform its healthcare approach, away from supporting traditional medical priorities, to a very different model that reworks hospital plans around the patient. 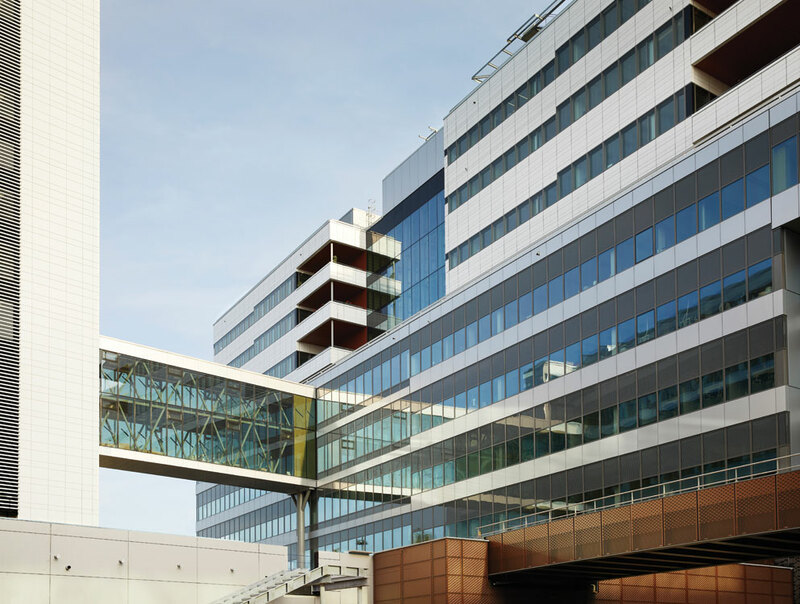 The new building greatly enhances the physical integration between the world-renowned medical university, The Karolinska Institute, and the hospital, helping university research staff and hospital departments work together. The other central reason for the project is that the region’s demographics are changing fast. Stockholm’s population is expected to increase by 350,000 between 2010 and 2020, with numbers of children and elderly growing disproportionately fast, as life expectancy continues to increase. Many Swedish hospitals were planned and constructed in the 1970s, and are inadequate in terms of responding to rapid developments in medical technology, procedures and treatments. The client also wanted to support interdisciplinary activities, i.e. exchange of ideas between medicine, research and education in the life sciences. Combining this with the flexibility needed for the inevitable future changes would be no small challenge for the project team. Sustainability was another key driver, and the project has been awarded LEED Gold, as well as Swedish Environmental Classified Building Gold. 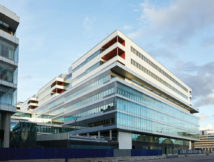 Energy consumption is less than half of a standard hospital, with 99.7 per cent of its energy coming from renewable sources, such geothermal heating – in addition it’s connected to a district heating network. 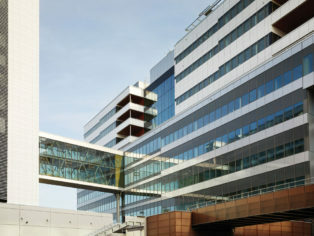 The project has been described by one of the two architecture practices involved, Tengbom, as “the single largest engine behind the development of Hagastaden.” This sees the council harnessing the reputation of the Karolinska Institute, hospital, and related local enterprises to create a new neighbourhood that sits between Stockholm and the outlying suburb of Solna. By 2025 the area will be full of apartment blocks grouped around workplaces offering world-leading research and highly specialised medical care, plus cultural attractions and green spaces. The area is already populated by an array of old hospital buildings, surrounded by the Institute’s academic facilities. One notable recent structure is Aula Medica, the Institute’s auditorium – encased in a rounded and expressively glazed form by Swedish practice Windgårdhs. Project architect for Tengbom, Christine Hammarling, told ADF that connecting to the university was “a very important part of the decision to choose the site.” She adds that it was decided during design development to centralise all facilities in one new building on one site rather than an initial idea to disperse buildings across both the Institute and hospital campuses. The project (a 16.2bn SEK investment – £1.4bn) was hugely demanding in terms of design resource. Around 60 Tengbom staff joined White Arkitekter in a specific project company, WhiteTengbomTeam, totalling 120. They set up shop in a dedicated office next to the site in 2010 – at the time the biggest architecture office in Sweden. The project was initially the result of a design competition, which resulted in White being appointed as the client’s architect, and therefore barred from entering the tender for the public-private partnership to build and then run the hospital. 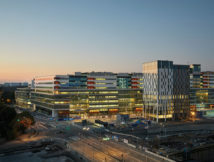 Skanska subsequently won what would be the country’s largest public-private project, with Tengbom as their architect. Christine Hammarling explains how the collaboration worked: “We had team leaders that worked on different areas, who raised questions to a focus group represented by two architects from Tengbom and two from White.” The hospital was the country’s most advanced BIM project yet, both supporting and relying on the strong collaboration across the teams. Hammarling says that the hospital’s facilities management team had an unusually large role: “From the beginning, they were a part of the bid, and the design process, including making revisions. Now they own the BIM model and are responsible for driving the hospital.” Now the hospital’s in operation, they are able to use the model as a 3D manual for example to assist them with locating and planning maintenance. emergency, maternity, childrens ICU, daycare and imaging, neonatal ICU, inpatient wards. 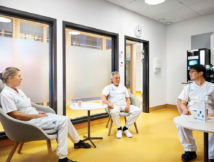 The single patient rooms are large, and bright, with a 3.2 metre floor to ceiling height, 2.7 metre high windows enhanced by ash frames, and enough space for relatives to stay overnight. Totalling 20 m2 (plus a 7 m2 “hygienic room” i.e. 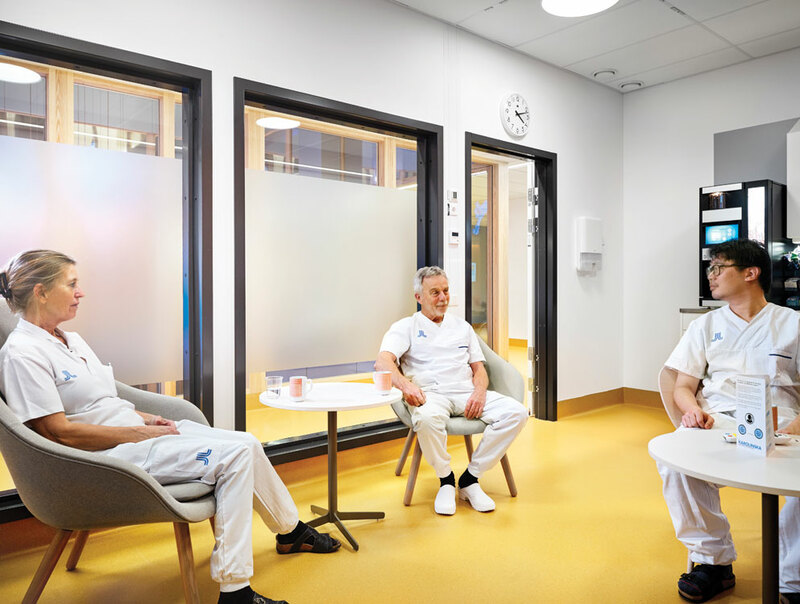 ensuite), their larger than standard-size also enables multidisciplinary teams including researchers from the Institute to work easily without compromising the patient’s dignity. The treatment rooms are placed along the facades, many overlooking the internal landscaped courtyards. Theatres, treatment rooms, staff areas and conference rooms also benefit from good levels of daylighting. 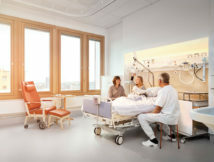 Intensive care units are organised differently from normal patient areas, with 25 m2 rooms and a nurses station each overlooking a pair of rooms. Generally speaking, floor to floor height is 4.9 metres, with the rooms’ generous dimensions being assisted by the corridors taking the brunt of services in their ceiling voids. Christine Hammarling says that the design team “strove for a sense of nature,” and this is present in some of the materials, for example the wood frames found throughout the building. While there are a lot of concrete surfaces, the public areas, including the entrance hall and the fourth level circulation in the ‘mantle’, have natural granite floorcovering. 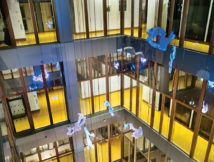 Adjacent to lift lobbies, these are “kind of lounges opened up to the city between the core buildings,” says Hammarling. There is solar control glass to the south of the building, facing the city, and the facade under the helipad has double glazing with an especially large cavity to cope with added noise. A rich colour concept was developed, inspired by the changing of seasons. Each of the core buildings has an strong individual colour scheme in clinical areas, ranging from green, to orange, blue, red and yellow, to assist patients with wayfinding given the huge size of the building. Patient rooms and circulation have a calmer colour palette, the former sporting a pale yellow floor colouring. The wood effect bedhead units in the patient rooms have been designed to resemble the ash frames, and to organise the services in an efficient way to optimise patient care. 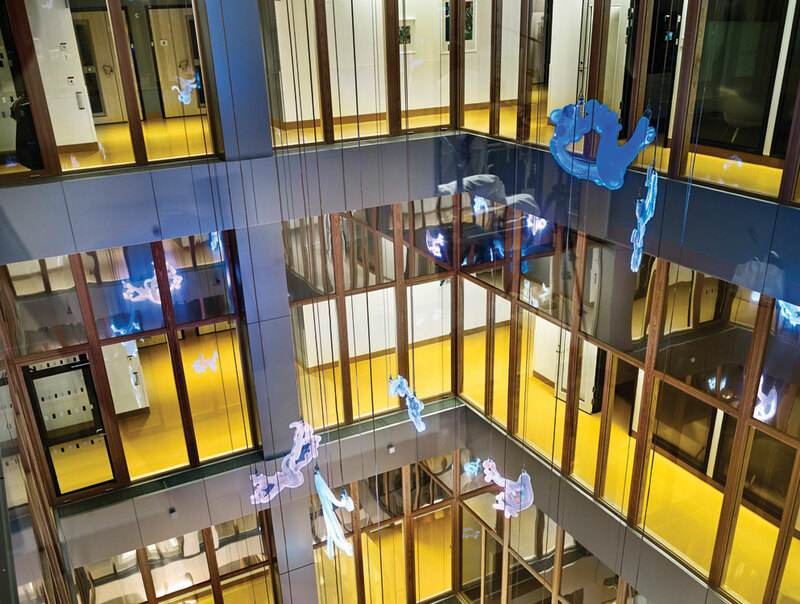 The new hospital has what is thought to be the largest “public display” of art in Sweden. Ranging from new installations, to relocated works, and newly commissioned wall art, the programme has been carefully specified, including in areas where patients don’t normally get to see the therapeutic benefits of art, such as in imaging units. 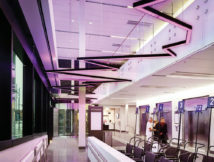 Christine Hammarling says that the ‘thematic’ concept that drove the design is particularly useful when it comes to the future flexibility essential for major hospitals: “The idea about the generality of the thematic concept is that you can organise the departments either vertically or horizontally as you want, over time. 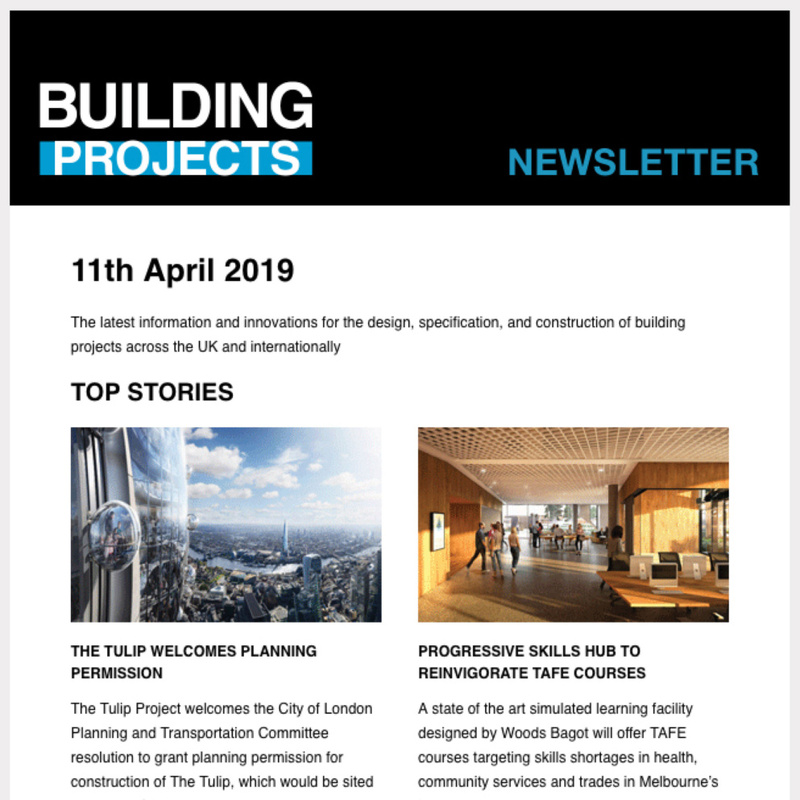 They can be located nearly anywhere.” Other specific examples of adaptability include the eastern end of the whole block, which has been designed to be extended on in future as changing requirements dictate. In addition, the ‘hybrid’ nature of several operating theatres means they can be adapted for use by any of the hospital’s departments, as well as used for x-rays. The hospital, despite its size, has the agility to be able to flex according to need, rather than functions being fixed. Lastly, further future adaptability was provided by “robust joists” – as Christine Hammarling explains. 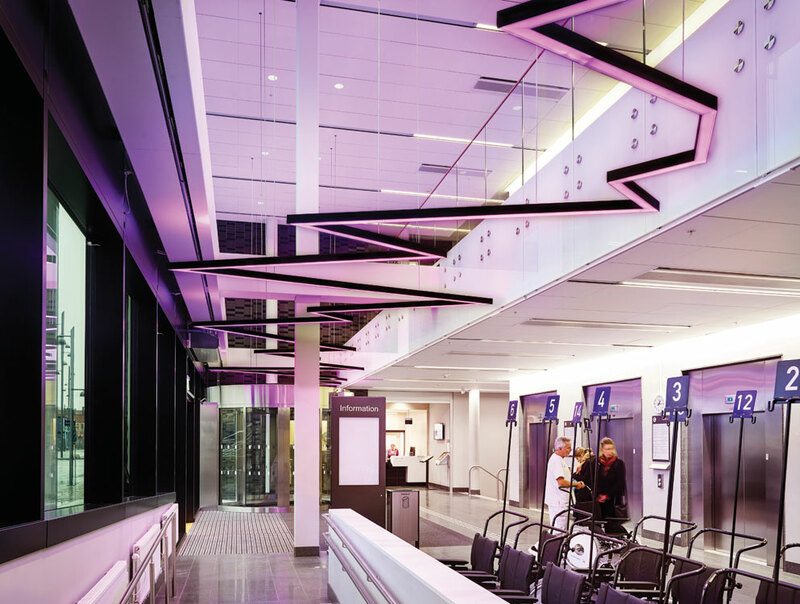 “It was a principle to have a small area at the edges of each core building, where you can expand and develop future installations within the existing service risers. This would mean that an area could be rebuilt to support a new care activity in the future without disturbing surrounding functions. One of the aspects that sees the hospital already living in the future is the presence of Autonomous Guided Vehicles (robot porters, basically). These low vehicles carry all supplies from a central hub, using prescribed routes and dedicated lifts. Stockholm County Council continues to grapple with the triple challenge of a growing, ageing population, a renowned research institution and hospital needing to collaborate, and a changing healthcare technology landscape calling for a looser-fit building for the future. It has the possible answer to all three in the Karolinska University Hospital. The architects have combined to produce something that is a flexible, futureproofed structure for healthcare; it locks into its urban fabric with precision-designed efficiency, but does not ignore the holistic needs of its end users – patients, staff, students and visitors. 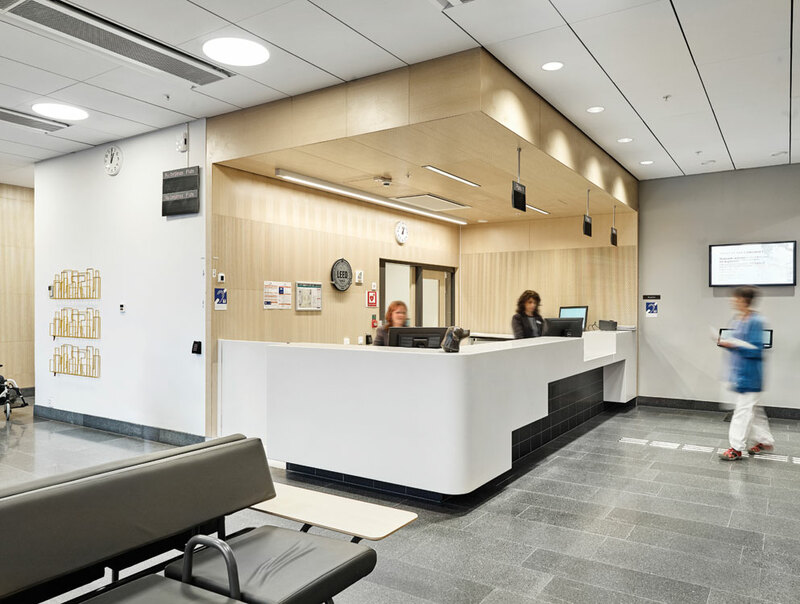 In fact, the human-focused design of Sweden’s newest major hospital puts them front and centre.